Tregaron Old Fire Station07855428791work Self-cateringCroeso / Welcome to The Old Fire Station in Tregaron, an unusual and comfortable self catering holiday cottage which is conveniently situated in the historic town of Tregaron. A perfect base for walking, golfing, cycling, bird watching, shooting, horse riding and so much more. The Old Fire Station is a unique and historic holiday cottage for two guests which has been refurbished to a very high standard and awarded 4 Stars by Visit Wales in July 2018. 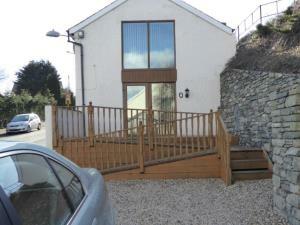 It is located less than a two minute walk away from the centre of Tregaron. "Yr Hen Orsaf Dan" (to use its Welsh name) provides an excellent base to explore some of the great unspoiled upland areas of Wales, the Cambrian Mountains. The views can be enjoyed from the living room through a picture window running the entire height of the building. Inside you will find everything you need to make your stay as comfortable as possible. There is an open plan lounge/kitchen/dining area, spacious double bedroom, separate wardrobe/dressing room and a shower room. Outside there is private off-road parking for two cars. Above the cottage is a secluded garden with excellent views of the Tregaron and the mountains beyond. Whatever your interests are, you will find that the area around Tregaron has something to offer everyone. If you fancy venturing a little further afield, the Georgian seaside town of Aberaeron is well worth a visit. Tregaron is also only 9 miles away from the University town of Lampeter and 20 miles away from the University town of Aberystwyth. If you are more active or adventurous, there are excellent walking trails and coastal/inland paths, plus opportunities for horse riding, shooting, golfing and mountain biking/cycling. Maybe you want to try your hand at something different, such as coasteering, surfing or dolphin spotting. All activities are available within a 20 mile radius. Tregaron itself has an excellent, historic and characterful Grade II listed inn facing the town square called The Talbot. Well worth a visit. Croeso / Welcome to The Old Fire Station in Tregaron, an unusual and comfortable self catering holiday cottage which is conveniently situated in the historic town of Tregaron. A perfect base for walking, golfing, cycling, bird watching, shooting, horse riding and so much more. The Old Fire Station is a unique and historic holiday cottage for two guests which has been refurbished to a very high standard and awarded 4 Stars by Visit Wales in July 2018. It is located less than a two minute walk away from the centre of Tregaron. "Yr Hen Orsaf Dan" (to use its Welsh name) provides an excellent base to explore some of the great unspoiled upland areas of Wales, the Cambrian Mountains. The Old Fire Station is located a few hundred yards from the centre of Tregaron at postcode SY25 6HD. If using a sat nav, your arrival destination will be exactly at The Old Fire Station. Approaching from Lampeter on the A485, as soon as you enter Tregaron, you will pass the Henry Richard School on your left, followed on your left by the Chapel (Capel Bwlchgwynt). The Old Fire Station is then on your left as you descend into Tregaron. You will see the sign for the fire station on the wall on your left, behind the parking area.